Home of Sliced Bread News Release from Chillicothe, Missouri! This clue appeared on Friday's episode of the quiz show "Jeopardy!" A contestant answered correctly, "What is sliced bread?" Q: "Something special is said to be the greatest thing since this food item that Chillicothe, Missouri claims to have pioneered." A: "What is sliced bread?" If you had tuned into the quiz show "Jeopardy!" Friday afternoon, you would have heard "Chillicothe, Missouri" mentioned in one of the clues. 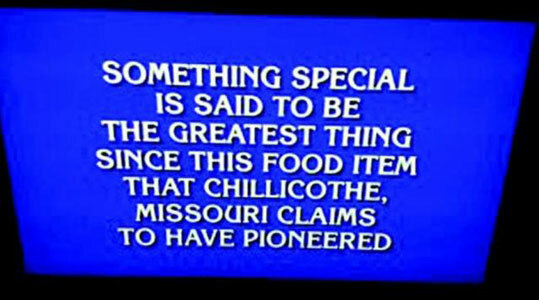 The clue, as announced during the show, was: "Something special is said to be the greatest thing since this food item that Chillicothe, Missouri claims to have pioneered." The correct answer, as provided by one of the contestants, was "What is sliced bread?" Dubbed as "America's favorite quiz show," the program features trivia in history, literature, science, pop culture, the arts, sports, geography and other topics. The show has an answer-and-question format, in which contestants are presented with clues in the form of answers, and must then phrase their responses in question form. Chillicothe resident Sarah Romeiser, who is an avid game show viewer, had her TV tuned into "Jeopardy!" Friday afternoon when the question came on. "I had the TV on and was looking at something else, when I heard 'Chillicothe, Missouri' mentioned," Romeiser said. She then utilized the replay feature on her television to see what had just aired. "That's something you don't normally hear," she said. "That's history, and that was pretty special to hear that on TV." The clue appeared in the "Midwest" category during Double Jeopardy! round, and was the $800 clue. The show's website states that its "Clue Crew" is always on the lookout for a great new location and welcomes clue suggestions. "Maybe your hometown is located on a famous historic site," the website states. "Or, maybe you know of an offbeat roadside attraction that would provide an amusing clue... if it's something that you find of particular interest, we probably do, too." It's unclear as to how the sliced bread question became part of the show. Nonetheless, Amy Supple, director of the Greater Chillicothe Visitors Region, said she was thrilled that Chillicothe got national mention. "I first learned of it Friday afternoon, when people from the community began calling our office to report having seen it," Supple said. "They were certainly excited, and so were we." Supple said the word started spreading via social media and email, and soon, lots of people were talking about it. "I have no idea how we made it onto Jeopardy!, but I am certainly glad we did," Supple said. "Whenever I travel or do trade shows promoting Chillicothe, people are always fascinated by the 'Sliced Bread Story,' and some already know we are the 'Home of Sliced Bread.' "Thanks to the hard work of people like Ed Douglas and all of the Sliced Bread Committee, the word is out. And, that means great publicity and name recognition for Chillicothe." Supple said she can only speculate about the kind of impact the broadcast had. "I would imagine there were some Google searches by some viewers out there who were curious," she said. "But, more than anything, it is just a nice pat on the back to let us know our efforts are moving us in the right direction." The Sliced Bread Committee formed about 10 years ago to raise awareness that Chillicothe was the first place in the world to sell commercially sliced bread to the public. One of the more recent endeavors taking place is a documentary being produced by KCPT public television about the history of sliced bread. The Sliced Bread Committee recently obtained an early bread slicing machine that is expected to be on display sometime in the future.